PS: Really loving her reverse mohawk. Your post is a relevant one. I work at a living history museum as a 1850s printer. There is a small nest right outside one of the open doors. 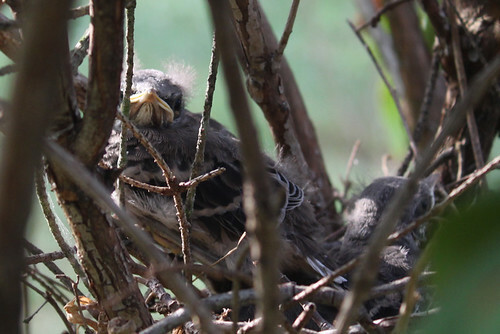 A mother bird has three eggs hatch and I followed their progress during a week long period, from fuzzy heads to standing to perched on the edge of the nest. I was so sure they’d fly by the next day. Unfortunately, the next morning, two of the three didn’t make it. I’m only hoping one did. To have heard the enthusiasm in their chirping one day to nothing the next was heart breaking. The mother has not been seen since. I’m hoping the nest will be reused. Thanks for sharing your better news. Oh, heartbreaker. There was another nest on the other side of my yard that wasn’t as fortunate. :( It made me so sad but I vowed that next year I’m going to toughen up and not become as emotionally involved. I’m glad one of them made it! Do you know what kind of bird she is? Yes, a heartbreak. Unfortunately, I found the third baby yesterday. I have no idea what type the mother was. I just don’t know.